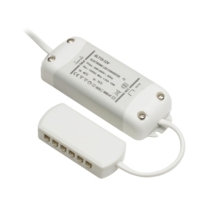 This 8 watt LED Driver with a 3 way port is essential for a successful LED light supply. It has protection against a short circuit and overloading, so you will always be safe when using your LED lights. The cables are not supplied with the driver as you'll usually find them attached to the light itself. I'm confused by answers to previous questions about how many lights can be connected to this. I want to replace a 8w driver which has two lights connected. Can I connect two lights to this? You can’t run two lights with this driver the driver you would require would be the 20w version with 6 way ports. How deep is the driver. I need to know if I can fit it into the pre-cut basin in the shelf. I have listed the dimensions of the driver below for you. Do you separately supply the cables that attach the light source to the driver? I can't make out what sort of termination the cable has. Unfortunately we do not supply these cables separately as they are usually attached to the light. Can I connect 4 x 1.8W LED lights to 1 x 8W led driver? Unfortunately this is not possible as the driver only has 3 ports for a maximum of three lights. What length of cable is supplied with the driver and does it come with a UK plug? Is it OK to connect just one 1.8w led downlight to the 8w driver? 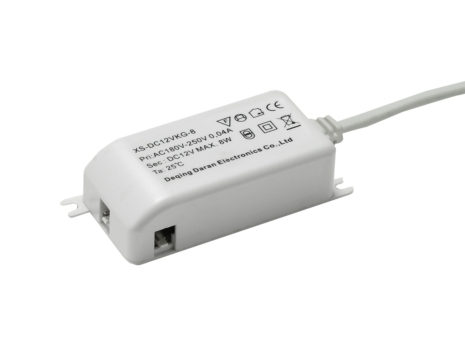 Thank you for your enquiry, yes it is fine to connect just one light with these 8 Watt LED Drivers.